When Chad St-Amand looks at a cut block of 10,000 cubic metres of conifers, one of his first questions is ‘how much is pulpwood and how much is sawlogs?’ The forest information services co-ordinator with Tembec Inc. in Timmins, Ontario, knows that getting the right product to the right facility has a direct impact on the bottom line. A new enhanced forest inventory is providing the company with information to make critical business and operational decisions before St-Amand even leaves the office. 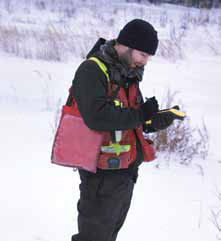 Tembec Inc. has worked closely with researchers from the Canadian Wood Fibre Centre (CWFC) of Natural Resources Canada (NRCan), science staff of the Ontario Ministry of Natural Resources, Queen’s University, Lim Geomatics, and Forest Analysis Ltd., to develop tools for LiDAR technology (Light Detection and Ranging) processing and operational implementation. The new approach takes a huge step beyond traditional forest inventory in providing detailed information down to the scale of the forest stand and below. From a single cutblock on one of Tembec’s large land bases in northeastern Ontario, the logs could go for pulp or lumber. And different sawmills have different size requirements to achieve a competitive level of performance. “With LiDAR-derived outputs, we are able to accurately describe the wood size characteristics to the mill managers. Having diameter size class as well as diameter distributions by block is definitely allowing this to happen,” said St-Amand. LiDAR collects information from ultra-rapid laser pulses for a 100 per cent enumeration of the surveyed area to gather information about forest stand attributes. A system of ground plots is used to calibrate the remotely sensed information. The result is statistically precise estimates of key inventory variables: tree height, volume, and basal area for every 20 metre by 20 metre cell across the surveyed area. Additionally, estimates of piece size distribution are derived from the LiDAR data at the same resolution. Diameter distribution results were also excellent, opening the door to uses such as determination of harvest rates and mill requirements, stand allocations during forest management planning, and budgeting. “In the past, this data was not available and it was pretty much a guessing game or the foresters would spend a lot of time doing field cruising work,” commented St-Amand. Enhanced inventory R&D is helping industry transform its management of fibre supply across the country. Corner Brook Pulp and Paper Ltd. in Newfoundland and West Fraser Timber Co. Ltd. in Alberta are working closely with CWFC, FPInnovations, and other collaborators on solutions specific to operational and strategic needs. For Jean Favreau of FPInnovations, having specific prior knowledge of forest structure and terrain offers many benefits. “You get better strategies for sorting and prioritizing wood, detailed maps for implementing silvicultural treatments, and detailed knowledge of the terrain for a better road network,” he said. Enhanced forest inventory information adds value to FPInnovations’ “FPSuite” platform used by companies to improve performance and reduce costs of forest operations. Additionally, FPInnovations’ “Optitek” log simulator enables evaluation of product recovery and value by cutblock. LiDAR information provides accurate digital elevation and surface models (DEM and DSM) to optimize block design, road location, and riparian zone definition. Further, such terrain definition enables the mitigation of environmental effects associated with forest operations. With the help of FPSuite, operations can reduce costs of trucking, road construction and maintenance, and pre-mapping terrain restrictions within blocks. In fact, Tembec estimates that the savings in road construction alone easily offset the acquisition cost of operational LiDAR. And enhanced forest inventory doesn't stop paying-back when wood is delivered to the mill. The better the log information, the better the optimizers can be set to control throughput, an important factor of sawmill performance, according to Alex Rapoport, Principal, HALCO Software Systems Ltd.
"In today’s demanding markets it is critical to have control over lumber mix, and doing so cost-effectively means having good control over throughput," said Rapoport. He believes that the LiDAR information would be a valuable input to HALCO's production planning optimization systems. "Size information also gives sales people a heads-up to expect a wider or narrower lumber distribution so they can market the right lumber to the right buyers." All along the value chain, from forest management planning through to processing in the mills, industry stands to reduce costs and capture value through enhanced knowledge of wood fibre growing in the bush. Rapidly advancing technology, economies of scale, and operational experience are combining to make LiDAR-based inventory cost-competitive with traditional inventories. Research is advancing the prediction of internal wood fibre characteristics and establishing a role for terrestrial LiDAR to more accurately profile tree and, ultimately, forest metrics. In time, forest managers should benefit from precise information on outside bark and internal wood fibre characteristics, and be able to reduce costs and boost value accordingly. Both Guy K.M. Smith and Steve D’Eon are Knowledge Exchange Specialists with the Canadian Wood Fibre Centre of Natural Resources Canada, which works with FPInnovations to optimize wood fibre value. For more information on precision forest inventory, please contact: guy.smith@nrcan.gc.ca, Tel. 705 541-5595 or steve.d’eon@nrcan.gc.ca Tel. 613 732-5595. Two woody biomass harvesting demonstrations were hosted by the Canadian Wood Fibre Centre (CWFC) and local partners in early December, one in Alberta and the other in Manitoba. On the Alberta site, 40 participants had the opportunity to observe and evaluate three different harvesting technologies at a short rotation woody fibre bioremediation plantation next to the Whitecourt waste treatment plant. Organized by Martin Blank, CWFC wood fibre and bioremediation technician, the harvesting demonstration featured a Claas self-propelled, Jaguar 870 harvester equipped with the two-row, HS-2 willow harvesting head; a pull-type WB-55 BioBaler manufactured by Quebec’s Anderson Group Co.; and, the 3-point-hitch mounted JF 192 single row willow harvester. There were a number of differences among the three technologies demonstrated. 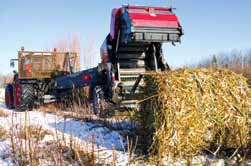 The Claas harvester and JF 192 harvester both produce wood chips, while the BioBaler produces round, woody stem bales. All three systems, however, showed no difficulty harvesting the 4 to 6 centimetre thick willow and hybrid poplar stems. 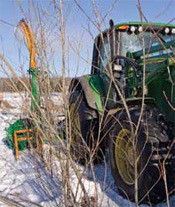 At the woody biomass harvesting demonstration hosted by the Canadian Wood Fibre Centre (CWFC) and local partners in early December in Alberta, three pieces of equipment were featured: the 3-point-hitch mounted JF 192 single row willow harvester (at left); a Claas self-propelled, Jaguar 870 harvester equipped with the two-row, HS-2 willow harvesting head (directly above); and a pulltype WB-55 BioBaler manufactured by Quebec’s Anderson Group Co.. When it comes to selecting the most appropriate harvesting option, Sidders says that individuals need to consider what is the most operationally appropriate and cost effective technology to provide the raw material for their desired end product, and consider which technology best matches the scale of the area slated for harvesting. The Claas harvester, designed to work on commercial plantations only, both cuts and chips the wood fibre, and can harvest as much as one hectare per hour. It was also the most expensive technology demonstrated, so a fairly large scale operation would be the most appropriate. It harvests two rows at a time, and requires an accompanying wagon to travel with the harvester to receive and transport the chips. The BioBaler mulches the stems and produces a round bale similar in appearance to a hay bale, that weighs between 300 and 400 kgs wet. It requires a 180 to 220 horsepower tractor to power and pull the implement. It can be used on commercial plantations or to harvest understorey or juvenile stems in natural forests. The bales can be stored on site and will naturally dry. The bales may require further pre-processing before the raw material can be used as feedstock. The BioBaler can harvest any plantation design. The JF 192 single-row harvester on its own is the less expensive option, but it also works at a slower pace. Manufactured in Brazil for harvesting sugarcane and corn, it has been adapted for harvesting and chipping willow and is currently being used successfully to harvest woody fibre. It also requires a tractor for power and transportation and must be accompanied by a chip wagon to receive and transport chips. On the Manitoba site, 35 participants attended the demonstration of the WB-55 BioBaler technology, harvesting second generation, short-rotation, concentrated woody biomass on a 60 hectare afforestation site on the outskirts of Winnipeg. Organized by Manitoba Conservation and Tim Keddy, CWFC wood fibre development specialist, and in cooperation with the landowners, Peter and Irene de Graff, the harvesting demonstration profiled the harvest and baling of several clones of hybrid poplar and willow up to as large as 12 centimeters in diameter. The recovered bales are destined for an industrial wood boiler. Forest companies and investors will soon have a better ‘current state’ profile of biomass availability in Alberta through an investment by Alberta Innovates Bio Solutions (AI Bio) into the development of a unique, world-class information management system. The concept is to gather data related to both forestry and agriculture biomass amounts, determine their availability, and pinpoint their geographic location using current information from a variety of stakeholders, including forest companies. The goal is also to identify information gaps, improve upon the quality of the information data and then present it to the world. “I think the information underpinning this system is going to give us a competitive advantage over some other jurisdictions in the world because no one else is going to have a system like this,” says AI Bio Executive Director, Carol Bettac, who is responsible for identifying emerging opportunities and strategic alliances mainly at the intersection between forestry, life sciences and agriculture. She adds that it will be critical to update the data on a regular basis to maintain its value over the long term. 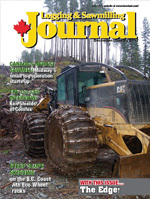 “What we envision is if there is a forest fire or if there is a policy that comes into place that takes a large amount of forest out of production with, for example, some of the proposed conservation initiatives in the province’s land-use framework, that we will be able to adjust the availability of certain kinds of biomass or fibre,” she says. Phase 1 of creating what is called the Bio-Resource Information Management System (Bio-Resource IMS) is being conducted by Silvacom and Green Analytics. They expect to complete their work by spring, 2012. There will soon be a better profile of biomass availability in Alberta through an investment by Alberta Innovates Bio Solutions (AI Bio) into the development of a world-class information management system that will involve gathering data related to biomass amounts and pinpointing their geographic location. Silvacom has been in business for 28 years providing analytical data and inventory services. Included within the company’s list of clients are all Forest Management Area holders in Alberta. Silvacom Board Chairman and Chief Strategy Officer, Bob Morton, says the creation of the Bio-Resource IMS is being demand-driven by industry and potential investors. “A lot of Silvacom’s clients have been approached by many different people in terms of the quality, quantity and availability of their biomass,” says Morton. “At present, there is really no way to answer a lot of those questions.” He says the idea behind Bio-Resource IMS is to be able to build a prospectus for biomass for a given geographical area at whatever resolution is required. It could be at the township, Forest Management Area, or county level. Data in the prospectus will also provide information on how different potential resources might be combined to meet a supply objective. Morton agrees that the Bio-Resource IMS is critical for future growth of the bio-economy in Alberta. “If you don’t know what you’ve got, you don’t know what the opportunities are, you don’t know how you can capitalize on that resource, you really don’t know what you are selling, and you don’t know what you might be giving up in terms of not capturing opportunities,” he says. The work being done by Silvacom and Green Analytics will include a few pilot studies to test the functionality and value of the Bio-Resource IMS and will help to find the knowledge gaps. Potential users and beneficiaries of Bio-Resource IMS include energy, forestry, and agricultural-based industries and businesses, financial institutions, academics, municipalities and communities, First Nations, and policy makers. They will have access to a unique decision support system built upon a platform of science and integrated private and public databases including biomass and other ecosystem properties such as carbon, biodiversity and water. Forest companies are being asked to participate in helping to gather the information during Phase 1 and Bettac says they will likely to be among the first beneficiaries of the development of this decision support tool. “If we go through this process properly, I think they’ll start to see the value of the system itself in terms of their business and maybe the potential to expand beyond their traditional products,” she says. Morton says that everyone, including forest companies, who they have contacted so far about creating the Bio-Resource IMS, have been very positive. Conducting this ‘current state assessment’ of available bio-resources tops the list of goals related to AI Bio’s overall BioE Initiative. It is a 10-year strategy for enhanced bio-economy research and innovation in Alberta. In collaboration with stakeholders in government, academia, and industry, AI Bio is leading the development of this strategy to advance Alberta’s bio-economy, focusing on the non-food, non-pharma bio-industrial sector. The full details of that strategy will also be rolled out in spring, 2012. It will recommend future approaches to investments and alignment of resources in those areas of the bio-economy with the highest potential. For more information on Alberta Innovates Bio Solutions’ Bio-Resource Information Management System, please contact AI Bio Executive Director Carol Bettac at (780) 638-3721 or carol.bettac@albertainnovates.ca.